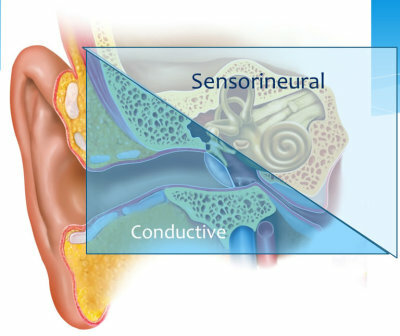 Sensorineuaral Hearing Loss: This type of hearing loss is the most common type of hearing loss. More than 90 percent of all hearing aid wearers have sensorineural hearing loss, resulting from problems in the inner ear or the auditory nerve. Inner ear hair cell damage is the most common reason for sensorineural hearing loss. These tiny hair cells, once damaged or destroyed, become unable to convert sound vibrations in to the electrical signals needed by the auditory nerve. Sensorineural hearing loss can be attributed to long-term occupational or recreational exposure to loud noise. It also commonly occurs in the later decades of life and is called Presbycusis. People with sensorineural hearing loss typically report they can hear people speak, but can’t understand what they’re saying. It often seems to them that people are “mumbling.” Usually there is no medical way to correct this, but hearing aids often help. Conductive Hearing Loss: This type of hearing loss is caused by problems in the ear canal and/or the structures in the middle ear. It occurs when sounds from the outside world cannot be transmitted normally through the ear canal and/or middle ear to the inner ear. 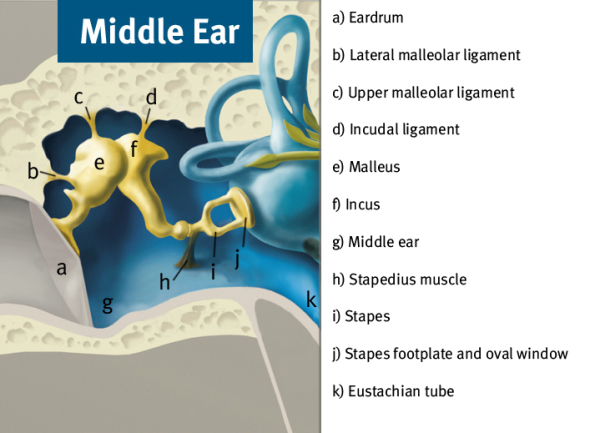 The most common causes of conductive hearing loss can be a buildup of wax in the ear canal, a perforated eardrum, fluid in the middle ear (common in children), or damaged or defective ossicles (middle ear bones). A person with conductive hearing loss may notice their ears seem to be full or plugged. Most conductive hearing losses can be medically or surgically treated. If for some reason the hearing loss cannot be corrected, hearing instruments can provide benefit. Mixed Hearing Loss: This kind of hearing loss is caused by a combination of problems in the middle and the inner ear or the auditory nerve. For example, the person may have a noise induced hearing loss from noise exposure and a perforation in the eardrum. The combination of sensorineural and conductive hearing loss is therefore, mixed. Presbycusis Hearing Loss: Age related hearing loss, or 'presbycusis,' occurs when the sound receptors inside the cochlea (inner ear organ) break down. This is an irreversible process. The ability to hear high pitched sounds is affected first. High pitches are responsible for clarity of speech. Individuals with high pitch hearing loss have trouble hearing in noise and often feel that they have trouble understanding, or that people mumble. Hearing Loss is usually a gradual change in hearing sensitivity over a period of years. Because it occurs so slowly, it often times goes undetected until later in life. Family or friends may notice that you are having difficulty hearing before you do. Talk to them about how they think you are hearing and then ask them to join you for a hearing test. A sudden change in hearing can occur due to exposure to a loud sound or a medical emergency. If you experience a sudden change in hearing, see an Audiologist as soon as possible. The Smallest Bones in the Human Body are the Bones for Hearing. In lay-terms: The Hammer, Anvil and Stirrup. 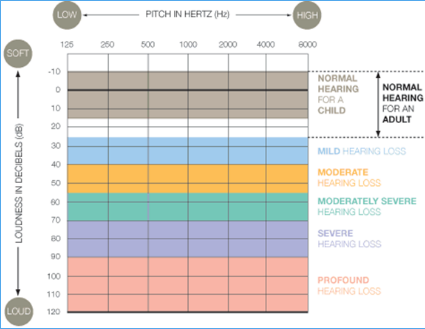 Hearing loss is categorized by the degree, or severity, of the hearing loss. Hearing is measured in decibels (dB) and the smaller the number the better the hearing. Dementia & Hearing Loss: Researchers from the Johns Hopkins School of Medicine in Baltimore partnered up with a handful of other research institutions from across the United States to conduct their experiment, which looked at 639 different adults aged between 36 and 90 years old. Between the years of 1990 and 1994, these adults underwent a series of tests to determine their cognitive and aural health and were monitored until the end of May of 2008. During these years, the researchers followed any potential development of Alzheimer's and dementia. Of these 639, none had dementia at the start of the study, 125 had a "mild" hearing loss (between 25 and 40 decibels lost), 53 had a hearing loss described as "moderate" (from 41 to 70) and a final 6 suffered from a "severe" hearing loss. These latter six lost more than 70 decibels' worth of hearing. The remaining 455 participants could hear perfectly. A mid-progress report was followed up after roughly 12 years -- after that period, it was found that 58 of the initial 639 (or just more than 9 percent) had been diagnosed as suffering from dementia, and 37 of these were Alzheimer's. It was found that those who suffered from hearing loss at the beginning of the study were more likely to develop dementia -- the greater the hearing loss, the more chance there was. There was a noticeable trend for the Alzheimer's, too: Baltimore's Dr. Frank Lin reported that for every 10 decibels of hearing lost, the extra likelihood of development jumped up by 20 percent. The risk was worst for those participants who were aged 60 or older -- 36 percent of the dementia risk was recorded as being associated with the hearing loss. Sadly, this research has recently been backed up by another, completely independent study. In January of this year, a study of 1984 adults was completed, after having run since 1997. It came out with similar results, but came with a few additional snippets of information. 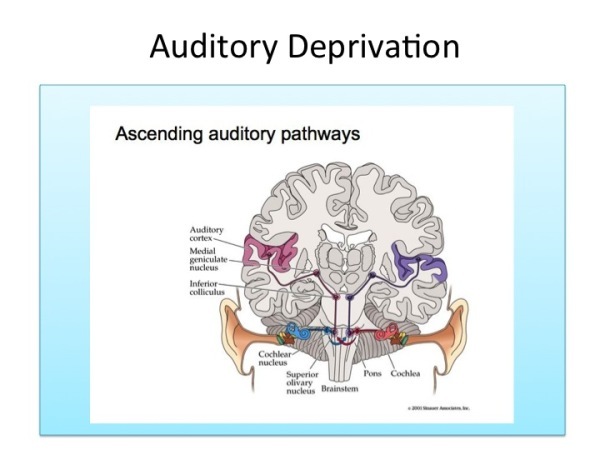 Firstly, it provided the rate of decay -- it was discovered that people who suffer from hearing loss would typically experience a loss of memory and thinking capabilities an estimated 40 percent faster than those who have no hearing problems. Currently, there is no known reason as to exactly why hearing loss seems to increase your chances of getting dementia so greatly, but there are many different theories being bounced around. These theories are wide in range, stretching from the fairly banal but believable ("cognitive overload," i.e., the brain tires itself out because it has to overcompensate to hear things) to the possibility that hearing loss is actually an indicator rather than a contributing factor -- the loss of the lower frequency sounds could act as a "warning sign" for vascular problems, which would cause both hearing loss and dementia. Other potential reasons include that hearing loss would lead to a certain amount of social isolation in life, which could potentially contribute to the decline of mental faculties that is dementia. The final theory is that they are simply linked, as in they are caused by similar things or involve similar processes. This last theory in particular could actually, if it turned out to be true, bring with it some good news: If the two symptoms share similar causes or processes, this could lead to early interventional methods against dementia being discovered. For now, the results are unknown, but these studies will prove to be invaluable in the coming years. If they help to further research into a potential Alzheimer's cure (or even vaccine, so to speak), then the agony of this debilitating condition could be something of the past.